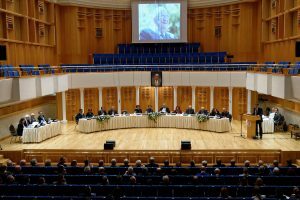 The most recent meeting of the Bilkent University Board of Trustees took place on Wednesday, April 3, in the Bilkent Concert Hall as part of the Bilkent Day program. Present were Vice Chairs Ergül Tunçbilek (who chaired the meeting) and Gülsev Kale, Board members Erol Arkun, İlker Baybars, Tezer Kutluk, Yahya Laleli, Ahmet Nalbur, Şencan Özme, Muhsin Saraçlar, Boğaç Üner and Kadriye Yurdakök, and Rector Abdullah Atalar. The meeting began with approval of the minutes of the previous meeting. Then, Vice Rector for Administrative and Financial Affairs Kürşat Aydoğan briefed the Board on budget and financial matters. The trustees reviewed the income and expenditures for the 2018 fiscal year, after which they approved the proposed tuition rates for the 2019–2020 academic year. The tuition fee will be 42,400 TL for students admitted in or before 2015, and 45,000 TL for those admitted during or after 2016. For students from abroad, the tuition fee will be $13,950 for those admitted in or before 2015, and $14,500 for those admitted during or after 2016. All tuition figures include 8 percent VAT.